While I've been staying at my Uncle's house I've had the privilege of indulging my love for animals and gardening. Many mornings I get up with my cousin Brianna at 6 am to help her with her chores. 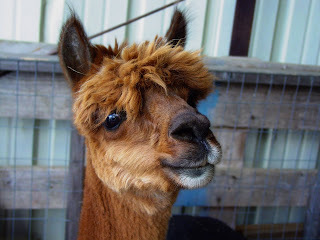 We feed the Alpacas and chickens, make sure they have water for the day and then water the garden. It is a wonderful way to start the day! Just a few days ago "shearing day" rolled around. All the Alpacas were due for their yearly haircut. I had never witnessed such an event and was very curious to observe what all goes on. I found myself not just observing but right in the thick of it. Catching a skittish Alpaca and getting them prone on a shearing table is quite the experience! Much like camels and lama's, Alpaca's are capable of spitting or drooling a very vile substance which made the process that much more exciting. They cry and "hum" very pitifully during the whole hour long process. I was given the job of holding their head. As I gazed down into their doe eye's, being careful to stay out of spitting range, and heard their mournful singing I began to hum back out of sympathy. I'm not sure what I was saying in Alpaca language but I hope that comfort was communicated one way or the other. Amazingly they calmed down and remained calm as long as I hummed to them. I found it to be calming to me as well. There is just something beautiful about spending an hour humming to an Alpaca.